The Permanent Press, 9781579622220, 320pp. 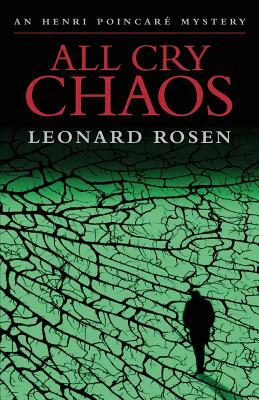 All Cry Chaos, a debut thriller by the immensely gifted Leonard Rosen, is a masterful and gripping tale that literally reaches for the heavens. The action begins when mathematician James Fenster is assassinated on the eve of a long-scheduled speech at a World Trade Organization meeting. The hit is as elegant as it is bizarre. Fenster's Amsterdam hotel room is incinerated, yet the rest of the building remains intact. The murder trail leads veteran Interpol agent Henri Poincaré on a high- stakes, world-crossing quest for answers. Together with his chain-smoking, bon vivant colleague Serge Laurent, Poincaré pursues a long list of suspects: the Peruvian leader of the Indigenous Liberation Front, Rapture-crazed militants, a hedge fund director, Fenster's elusive ex-fiancée, and a graduate student in mathematics. Poincaré begins to make progress in America, but there is a prodigious hatred trained on him—some unfinished business from a terrifying former genocide case—and he is called back to Europe to face the unfathomable. Stripped down and in despair, tested like Job, he realizes the two cases might be connected—and he might be the link. This first installment in the Henri Poincaré series marries a sharp, smart mystery to deep religious themes that will keep both agnostics and believers turning pages until the shattering, revelatory end. Anyone who enjoys the work of John Le Carré, Scott Turow, Dan Brown, and Stieg Larsson will relish Rosen's story telling and his resourceful, haunted protagonist. Others will appreciate his dazzling prose. Still others, the way he bends the thriller form in unconventional ways toward a higher cause, in the vein of Henning Mankell in The Man From Beijing. In short, All Cry Chaos promises to become a critical success that garners a broad readership throughout the nation and across the globe.